Oregon Department of Education Child Nutrition Program Director Joyce Dougherty accepted this year’s Red Plate award from Bob’s Red Mill founder Bob Moore after telling a lighthearted story of how her late mother only made cornbread using Bob’s Red Mill Medium Grind Cornmeal. She said that if they baked in heaven, her mom was surely still using it. The story was a fitting anecdote for a woman raised on her mother’s home cooking and enthusiasm for food, nutrition and health. Joyce was honored as part of the Moore Family Center for Whole Grain Foods, Nutrition and Preventive Health’s Food, Nutrition & Health Update conference. Held on Feb. 23, the conference featured sessions led by experts in the field from the CPHHS, Oregon Health & Science University and the University of Illinois. This year’s keynote speaker was Marian Smith Edge, Founder of AgriNutrition. L to R: Bob’s Red Mill Director of Corporate Outreach Lori Sobelson; Moore Family Center Endowed Outreach Coordinator Renee Carr; CPHHS Emeritus Dean Tammy Bray; Bob Moore; Joyce Dougherty and Moore Family Center Director Emily Ho. Renee, Tammy and Bob are previous Red Plate award winners. Joyce began her undergraduate studies at Oregon State. 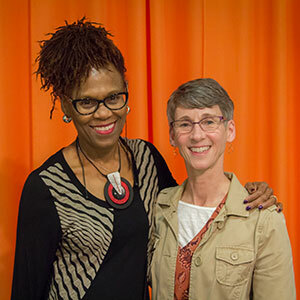 She finished her degree at Portland State University and returned to OSU years later for her master’s degree in Food and Nutrition Science (Child Development Family Life) and her Ph.D. (‘86) in Education/Nutrition, where she worked alongside emeritus professor Dr. Betty Johnson. A true Beaver at heart, she reminisces about returning to Corvallis years after moving away. “What really stands out about when I returned to Corvallis is that I was coming back to a small community, which is what I was looking for at the time. I could ride my bike anywhere and everywhere,” she says. Following her graduation from OSU, the Portland native headed south to Los Angeles for a dietetic internship with a program for children with special health care needs, which was affiliated with University of California, Los Angeles. Joyce then moved to San Diego for her first job as a dietitian with Wellstart, an international lactation program. A few years later, she took a job with the state of Washington’s Division of Community and Family Health as a public health nutrition consultant. She worked there for a decade overseeing various statewide nutrition projects and providing nutrition consultation to numerous departments, districts and community clinics. When a colleague told her of an opening at the Oregon Department of Education, Joyce applied and was hired. It was time to go home. Joyce says she loves her job. She oversees the USDA Child Nutrition Programs –including the National School Lunch Program, School Breakfast Program, Summer Feeding Program, Special Milk Program and the Fresh Fruit and Vegetable Program ­– for Oregon’s public school students. Her passion for nutrition radiates as she talks excitedly about the thing she enjoys most about her job – the people. No job is without its challenges, but for Joyce it’s the results that keep her going. “We support the whole child with various collaborations within the department, including nutrition and academics. I see this as something very positive because we are looking at the impact of health and nutrition on learning and the positive impact it has,” Joyce says. Sarah, whom Joyce considers not just her supervisor but also a mentor and friend, says she is thrilled for Joyce to be recognized because it’s well deserved, and she knows that Joyce truly appreciates the recognition. For the past 17 years, Joyce has worked to apply that advice in her work and make sure color is on the plates of half a million children and adolescents across Oregon.